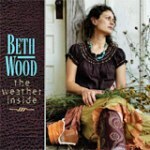 “The Weather Inside,” Beth’s 8th studio album, was produced by Billy Crockett at Blue Rock Studio in Wimberley, TX. Released fall 2010. Featuring some of Austin’s finest musicians including Jon Inmon, Roscoe Beck, Rick Richards, Dave Madden, Drew Womack, Billy Crockett, with a special guest feature by Native American flute player and musical wonder Gentle Thunder. “The Weather Inside” is a case study in contrast. A coming-of-age statement record from a veteran artist, Beth’s latest work embraces strength and tenderness, the polished and the well-worn, the broken and the hopeful heart. “The Weather Inside” delves deep into Beth’s creative reserves and delivers a strong collection of songs and performances to remember. And will I always be the new kid? Will I always be the new kid? How the hell will I get through this? But baby, don’t we all? You think you know Empty? You think you know Lonely? You think you know Beauty? But what if the poison were imagined? And what if love were mine to choose?